In describing Claudia Flood’s work, the late Thomas Albright, Art Critic for the San Francisco Chronicle, described her work as “dramatic, bold and colorful”. Her pictures evoke an offbeat style that is uniquely her own. Claudia has had one woman shows in San Francisco: Atrium Gallery, San Francisco, all the way to showing in Galleries in Genoa Nevada, and the Lone Tree Gallery, Minden Nevada. She has had a one woman show at the Mendocino County Museum, Willits, Ca. to showing at the Wilkes-Bashford Gallery, Mendocino, Ca.A one woman show at the Lake County Wine Studio, Upper Lake, Ca., and was the featured artist at The Towers Gallery, Cloverdale, Sonoma County, Ca. Congressman Mike Thompson (Democrat- St. Helena, Ca. -- See photo below) chose one of Flood’s paintings for his D.C. office: “Mendocino County History Maker’s”. The painting is shown behind Claudia in her Biography photo. Her work has become prized among private art collectors around the country. 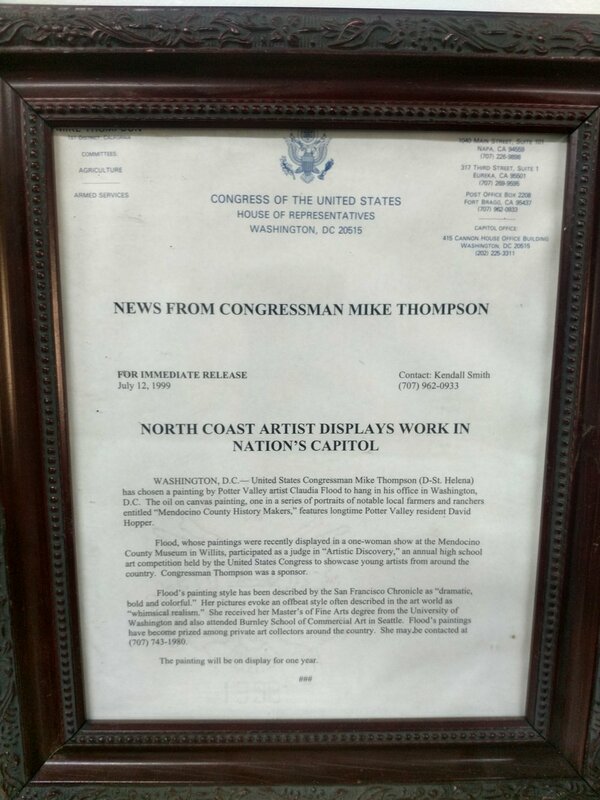 Claudia Flood was recognized by the Office of Congressman Mike Thompson, with her art on display in his office. Kendall-Jackson, Sonoma County, Ca.commissioned Claudia to do the original art work for Kendall-Jackson’s Heirloom Tomato Festival, “Sleeping with Giants”. (Prints are available, check the Gallery page.) Kendall-Jackson also commissioned Claudia to do an original painting of the Kendall-Jackson tasting room and gardens; the painting is on display inside the Tasting Room facility in Santa Rosa. She was also commissioned by Kendall-Jackson to paint custom presentation boxes for wine and promotional items. Wilson Winery, Healdsburg, Ca.commissioned Claudia to paint original art work for promotional Winery poster. Jaxson-Keys Winery, Hopland, Ca.commissioned Claudia to paint original art work for promotional Winery poster. Clos-du-Bois Winery, Sonoma County, Ca. : custom original art work on hand painted wine bottles for Wine Song Charity auction, Mendocino, Ca. This vibrant original work was commissioned by the Kendall-Jackson winery. Claudia attended the University of Washington, Seattle, Wa. Burnley School of Commercial Art, Seattle, Wa. and College of Marin, Kentfield, Ca. She lives in a small town in Northern California.